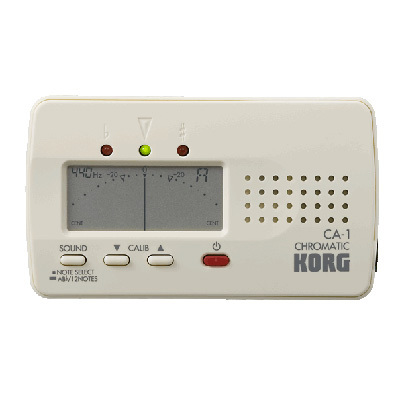 For nearly a decade, the Korg CA-30 Chromatic Tuner has stood among the top-selling tuners on the planet. Now meet the CA-1; offering the same excellent features with a new, enhanced design – all at a lower price! High accuracy and superb functionality have made Korg tuners the worldwide favorite. And now, the new CA-1 joins the best-selling CA series of tuners. With even more features, like a pitch reference tone and marks for pure major thirds and minor thirds, the CA-1 packs basic functionality and convenient tuning functions into ultra-compact bodies. This compact chromatic tuner supports a broad range of C1 (32.70 Hz)-C8 (4186.01 Hz), allowing speedy and high-precision tuning of wind, string, keyboard, and other instruments. This tuner is ideal for tuning even low-register notes containing numerous overtones that are often difficult to tune. A high-sensitivity mic is built-in, allowing easy and accurate tuning of acoustic instruments such as ukuleles. A separately sold CM-100 contact mic can also be used to send the vibrations directly to the tuner for even more accurate tuning. Although the CA-1 is small, thin, and light, don’t let its pocket-sized body fool you. The CA-1 packs the functionality needed for tuning a wide range of instruments. From studio to stage, tuning is easy and convenient. The back of the unit includes a unique arc-shaped "tilt slit" that lets you insert a plastic card for use as a handy stand. In addition to visual tuning via meter, the CA-1 can play reference pitches from its internal speaker (Sound Out) for tuning by ear. Each press of the Sound switch will cycle through the A4-Bb4 notes commonly used for tuning wind instruments. Or you can hold down the Sound switch to change the cycle to the semitone intervals from C4 through C5 (one octave), allowing reference pitches for any instrument to be sounded quickly.